Hi ya everyone! New challenge on the Whimsy Stamps Challenge blog today. It's a fun one and will get you to use those stashed metal embellishments. The challenge is to use metal and I did so with my button that's a bit hidden under the butterfly and also on the little brad on the seed packet. I used a number of fun embellishments on this creation. 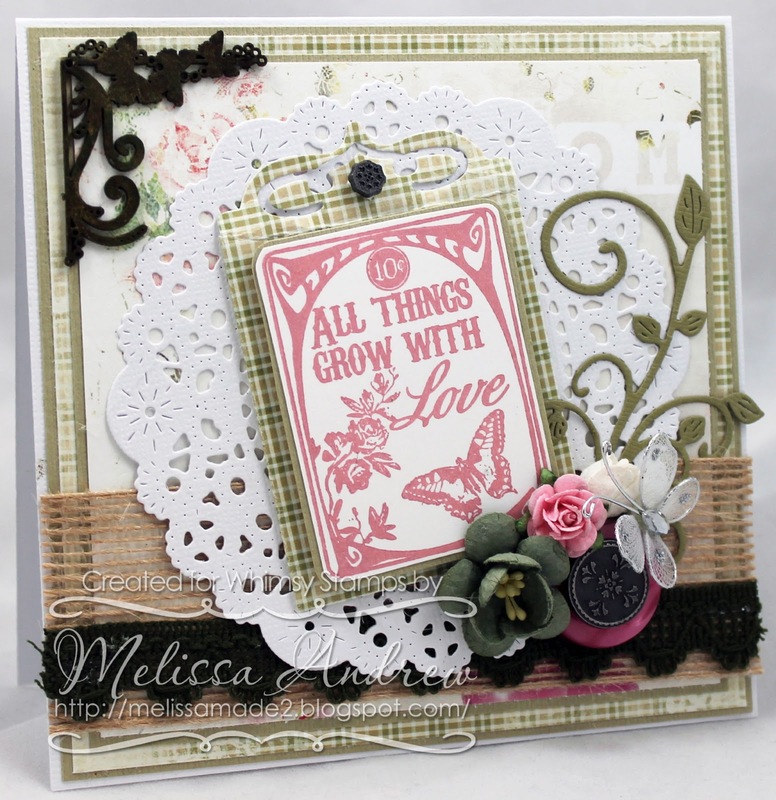 The stamp is from the new release at Whimsy called Vintage Seed Packets 2 which I stamped in Versamagic Ink. The seed packet die is also new from Whimsy. I used a piece of chipboard from Whimsy too, called Butterfly Swirls which I painted with acrylics. Last, but not least, the paper is from the new paper from Whimsy called New Beginnings. The lacey die is from Cheery Lynn Designs and the leave pattern is as well. I love everything about this beautiful card! You are one of my favorite card creators and colorers; you always do such a fabulous job! hello, what a nice card,garden related things seem popular this year in crafting, love whimmsy. love bluebell-flowerwood.